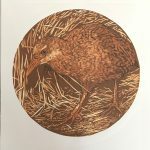 Manu Berry is a fast-rising young New Zealand printmaker carving a distinct name for himself with dramatic and assured woodcut and woodblock prints. Born in Otago, now based in Wellington, he has caught the attention and praise of senior artists and reviewers, and his individual style has captured a growing following among art collectors interested in New Zealand stories and evocation of place. Manu Berry is sometimes inspired by the landscape, at other times by narratives and his most recent series focuses on a distinctive view of native birdlife; he is a master of creating mood in his woodcuts through washes of colour layered as if in a painting, but without the certainty of viewing it until the print is revealed. He works in very limited editions – usually only three or five in each edition, as he likes to move on to new ideas for each exhibition. As they are very affordably priced, the prints sell out quickly (enabling the artist to move on to the next suite!). Each work has subtle variations in the level of inking as they are hand-worked. Born in Otago in 1978, Manu Berry lived in St Bathans as a child, growing up in a creative environment – his mother is a well-established Otago painter and printmaker, and noted artist Grahame Sydney is a long time family friend. The family then moved to Dunedin, where he attended art school after travelling round New Zealand. However he found that he had a strong sense of where he was going with his art and struck out on his own after a year at art school, much like Wayne Seyb whose woodcuts inspired him to work in that very direct medium. Manu Berry’s work is distinctive for his expressive use of layered colour created by wiping some of the ink off before printing, and layering other colours over, so that each print even within a limited edition may have slight variations – like a monoprint. He particularly concentrates on woodcuts rather than oil painting because the process is defined and doesn’t allow the artist to go back and change the work or put more in: he says it suits his “slightly impatient temperament”. Manu Berry has exhibited regularly in galleries around New Zealand, particularly in the South Island, since 2000, in solo and group shows and was a prizewinner in the Mainland Art Awards in 2005.